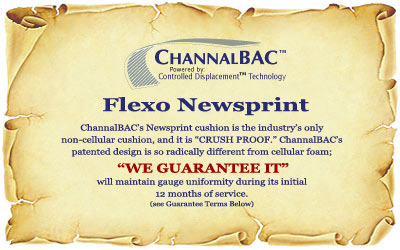 Performance Guarantee: ChannalBAC is the industry's only non-cellular Newsprint cushion and it is "CRUSH-PROOF." Due to its unique design and proven history, CDT guarantees ChannalBAC will maintain gauge uniformity or we will replace it free of charge. To be clear, when a wrap is severe enough to rip plates from the mounting mechanism, ChannalBAC could be damaged. Physical damage from operator error or a severe wrap is NOT covered under this performance guarantee. While ChannalBAC is crush proof, it is not destruction proof. If you experience gauge loss within 12 months of purchase, please contact your sales or customer service representative for a return authorization number and product replacement.